November 5, 2008 at 9:17 am · Filed under Lectures, News, Notices, Video, What is Kabbalah? In this video Bnei Baruch senior instructor Tony Kosinec introduces the upcoming course in authentic Kabbalah at the Bnei Baruch Education Center. 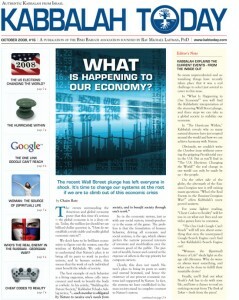 In this Kabbalah Today issue you will find articles on the current economic crisis and the upcoming U.S. elections. Also, just in time to close the period of submissions to Project 10^100 by Google an article on Google’s apparent success in the last couple of years. Make a Difference, Cause a Social Change! We’d like to thank everyone for all the comments, e-mails and contributions we’ve received! They are informative and inspiring. We feel that we have an active discussion on our hands and our hopes of a meaningful dialogue are gradually being realized. We are continuing our efforts to develop a few pitches for Google’s “Project 10 to the 100th,” and the one we are now brainstorming on is – a media campaign. As we saw in our last post, many of you responded with examples of commercials and media that highlight the action of giving in society. We really enjoyed those examples, and we’d love to see more of them. This will not only inspire our creative process, but will also help all of us stay on the same page and think along the same lines. So please send us links to videos that demonstrate the values of altruism and giving in an effective way, and keep sending us your general comments about the contest. A Global Impact to Better the World? “Create (and constantly develop) a worldwide marketing campaign, which focuses on promoting altruism as the “in-thing” – that we can be respected in society only by our altruistic actions toward others. In other words, we use all sorts of imagery, arts, music, media and culture to make it “cool” and respectable to help/give to/love/think of other people. What do you think about this idea? And what about the videos? Do you think that such publicity might actually convince (and maybe even change) people? Would it make an effect on you? We’d love to know what you think about it. Will Project 10^100 Change the World? “Unreasonable use of our natural and human resources drove us to the world’s crises. It’s up to humans to make the decision to start utilizing all the earthly resources in a way that will guarantee the survival and development of humankind and other species on the planet. Why does it seem like we are incapable of taking the right decisions for our own good? We must develop our awareness to the root of our problem: exploitation of natural and human resources for egoistical purposes. Therefore, I suggest that Google would create an Online Supranational Court of Judgment. This Court would accept accusations of egoistical actions committed by authorities, governments, powerful individuals or companies which would be notified to present their defenses. All cases would be openly examined by a committee of worldly known intellectuals (scientists, spiritualists, humanists). After reading the committee’s analysis, users would vote on the action in the following way: H- human, or E – egoist.